MadSportsStuff Crazy Paw Socks, Over the Calf. High performance athletic paw socks for all team sports and elite athletes. Shoe Size: Small - Youth 12-5 Womens 4-7, Medium - Womens 7-10 Mens 6-9, Large - Womens 10-13 Mens 9-12, X-Large Womens 13+ Mens 12+. For boys or girls, teams and gifts. Ideal for softball, baseball, lacrosse, basketball, field hockey, volleyball, wrestling, soccer, football, cheer, kickball and more! 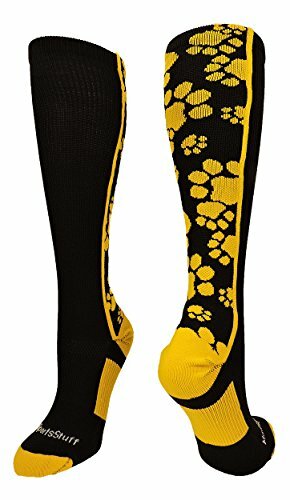 PERFECT SPORTS SOCKS: These Crazy Paw socks are a great way to show your team spirit for mascots such as the Wildcats, Jaguars, Cougars, Panthers, Grizzlies, Lions or Tigers. Ideal for softball, baseball, lacrosse, basketball, field hockey, volleyball, wrestling, soccer, football, cheer, kickball and more! If you have any questions about this product by MadSportsStuff, contact us by completing and submitting the form below. If you are looking for a specif part number, please include it with your message.